and the evolution of Hangouts: Hangouts Meet and Hangouts Chat. To make the most of these opportunities, we’re announcing several updates to Hangouts, Gmail and Google+ that make things much simpler for both enterprise administrators and users. Streamlining the messaging experience for Android: At Google Cloud Next, we announced that we’ve evolved Hangouts to focus on two new experiences that help bring teams together and keep work moving forward: Hangouts Meet and Hangouts Chat. We’ve been working hard to streamline the classic Hangouts product for enterprise users, and, as part of this effort, will be removing carrier SMS functionality in the classic Hangouts app for Android, starting on May 22. For administrators: If your domain is affected by this change, you can expect to receive an email notification with additional details in the coming days. Upgrading SMS with Android Messages: We want to provide a consistent and easy-to-use SMS experience for Android users, right out of the box. So we’re focused on making Android Messages the primary place to access SMS and are working with carriers and device manufacturers to include Android Messages natively in Android devices. Over time, we’re working with partners to upgrade SMS to RCS—the next standard in carrier messaging that will bring features like read receipts, group chat, hi-res photo sharing and more. Hangouts on Android users: In the next few weeks, you’ll see a notification in the classic Hangouts app to switch to another SMS app already on your phone for SMS, or to download Android Messages if one isn’t available. Choosing a new messaging app will not impact your SMS message history, and all your messages will be accessible in whichever new app you choose. Note: This change does not impact Google Voice users who may continue to use Hangouts for their Google Voice SMS. Project Fi users who wish to use Hangouts as their SMS app will also not be impacted by this change, and can consult the Project Fi forum for more detail. Third-party XMPP clients will continue to work with Hangouts for 1-on-1 chats. XMPP federation with third-party services providers will no longer be supported starting June 26. The legacy Google Talk Android app was replaced in the Play Store in 2013 and will now stop functioning. 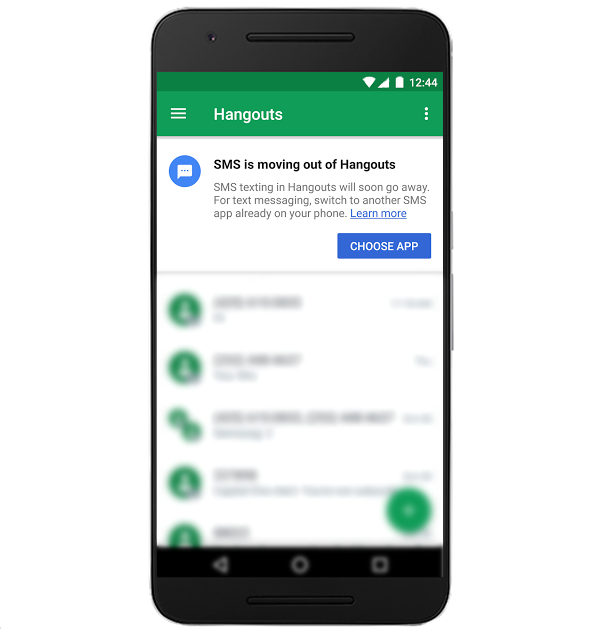 Android users are encouraged to install Hangouts now. For G Suite administrators: If your domain is affected by this change, you will have already received an email notification about this change. We realize these updates may be an inconvenience, so we aimed to minimize disruption and help you navigate the changes where possible. These updates will help us focus and prioritize features that will improve the entire G Suite user experience for everyone. To monitor the retirement dates for these features, subscribe to the G Suite What’s New Calendar.